Bat Boy, 9, Dies After Being Struck In Baseball Game : The Two-Way During his team's game Saturday, Kaiser Carlile was hit in the head by a bat as he ran past the on-deck circle. The accident has left a Kansas community in mourning. Kaiser Carlile, 9, the bat boy for a summer-league team in Kansas, died Sunday after being injured in a game Saturday. In a tragic accident that has left a Kansas community in mourning, a bat boy hit in the head by a player taking practice swings Saturday has died of his injuries. 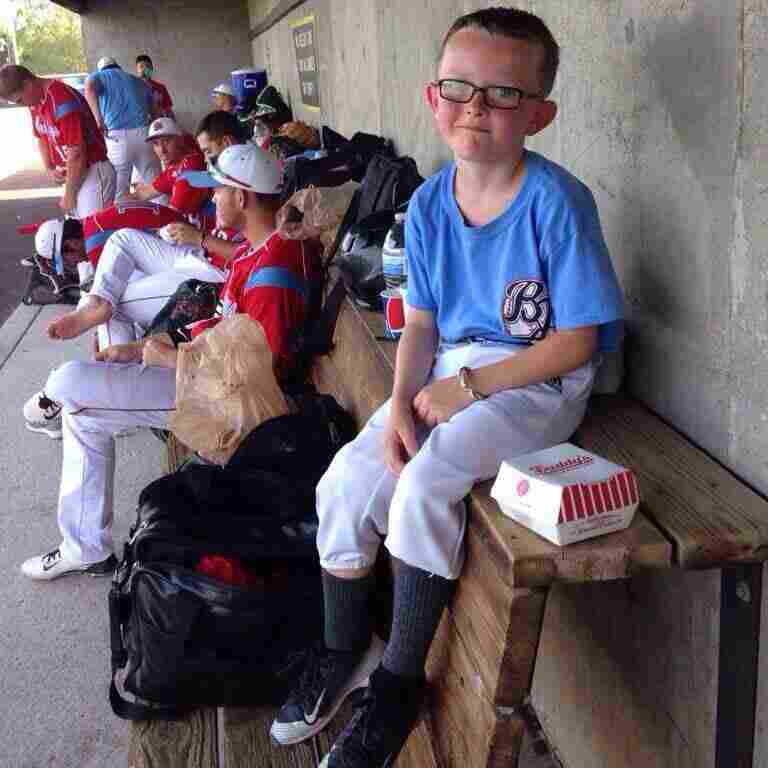 Kaiser Carlile, 9, was a well-loved part of the Liberal Bee Jays, a summer league team for college players. Photos of Carlile show him as a freckle-faced boy: hustling around the field, sitting in the dugout and talking with the players. But during his team's National Baseball Congress World Series game Saturday in Wichita, he was hit in the head by a bat as he ran past the on-deck circle after an out. Carlile was wearing a helmet, witnesses say, when he was struck while retrieving a bat. The boy quickly received medical attention — from both the home plate umpire, who reportedly works as a paramedic, and from a team of EMTs who were already responding to another call at the stadium, according to The Wichita Eagle. "With the permission of the family, and with much sorrow and a very broken heart, I regretfully inform everyone that Kaiser Carlile passed away earlier this evening. Please keep his family and our team in your thoughts and prayers. Thank you all for the support during this ordeal!" The amateur team, which has been a fixture in the town of Liberal, Kan., for decades, had been using its Facebook page and Twitter feed to update fans on Carlile's condition, and to request help for his family's medical bills. Carlile's injury quickly sparked shows of support, from a rival team's bat boy wearing a Bee Jay's jersey to the team's current and former players sending their respects. One of them is pitcher Kadon Simmons, who wrote that Kaiser was "a little brother I never had." "You took the field with us every game this summer. You were, and always will be a Bee Jay. No person or team could ask for a better bat boy. It is terrible to see you leave in such a way, but knowing your last moments were on the baseball field makes it easier through this whole process, because you were doing what you loved."